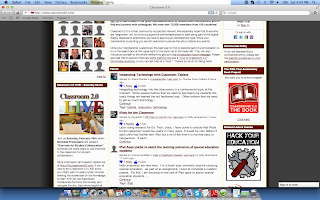 While visiting Classroom 2.0, I wanted to pay particular attention to the usage of texting. In an article I read on Pew Internet, 77% of Americans in rural areas (where I live) have a cell phone. This includes the elderly, who statistically do not own cell phones as frequently as younger adults. I know that not all, or not even most of the families in my class have Internet access. However, they do have phones. During student teaching, newsletters were all sent via email from the teacher weekly. This is not an option in my school, as too many students do not have that access (should I say #perksofcountryliving). I’m really interested in setting up classroom texting. This text can be sent from my phone directly to the parent’s cell phone. Classroom 2.0 led me to Remind101. This site seems easy to use and free, which is a perk for me. It will be nice to remind parents of things like: “Don’t forget conferences are Tuesday and Wednesday” or “Your child’s project is due tomorrow!” I don’t necessarily foresee any issues besides the fact that I know not everyone falls into that 77% of Americans with cell phones, so there will be a few without access. But, if I get 77% of projects turned in, it is better than nothing. 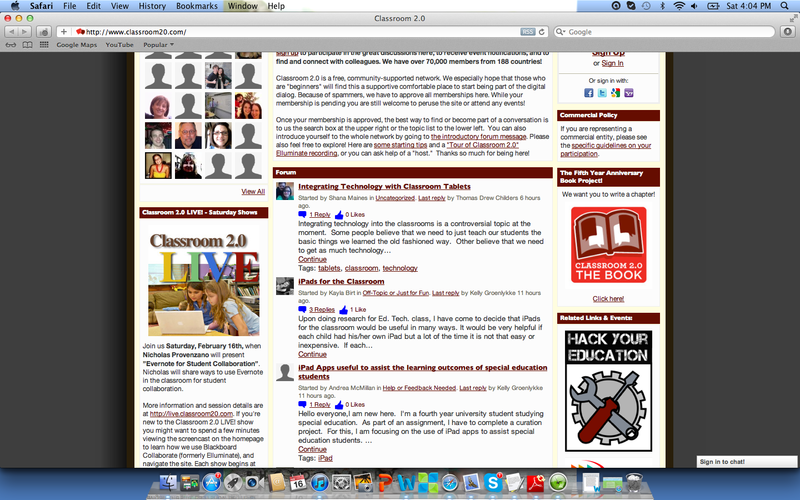 I also took a ScreenShot of the first thing I saw on the Classroom 2.0 site. Every iPad and Tablet related discussion in the forum. I just want to say that it breaks my heart every time a teacher tells me about how cool iPads and Tablets are and the positive impact they have in the classroom. I suppose that is just the little, jealous, green monster inside of me. On the cellphone page, I did see a forum discussion about using cell phones in early elementary (kindergarten specific). The author was asking how others used it. There were no replies to the post, but over 40 page views. It looks like there is a lot of us out there in early elementary in the same boat. I’m hoping the Remind101 will be a great outlet for us to use cell phone technology, but just with parents. ***On a side note: I love my iPhone. But as a first grade teacher, mobile devices stress me out. The kids who have these iPods, MP3 players, mobile phones simply to not know appropriate usage of them. After Christmas, a handful of my students had been bragging about these new mobile gifts they received, including the fact that these items were in the student's backpacks. They don’t know how to take care and protect them. Last week for example, my little Mr. Sticky Fingers in our class swiped an iPod touch from another student’s locker. This somehow becomes my responsibility: the retrieval, the return, etc. I am all for using technology in the classroom, but they are six. For CEP820, I'm focussing on digital citizenship. But, some things, in my opinion, are very parent oriented, If you have a child with an iPhone, tell them not to show it off to others.